If Reid is against it; there has to be good in it. Harry is afraid of what may yet be exposed about Washington and the elite; of which Mr. Reid can not escape, retirement or not! Reid Statement on the Election of Donald Trump… — ~THE ORIGINAL~ GUNNY G — BLOGGIN’ BAD! via Reid Statement on the Election of Donald Trump… — ~THE ORIGINAL~ GUNNY G — BLOGGIN’ BAD! I’ll take Charlie over Harry anytime! Lets be fair, many are; there’s Hillary and Ted ………..and many others. Harry Reid sees a monster, his name is Donald Trump. Oh the irony! Harry Reid is one of the most corrupt jackasses in the Senate. Harry called Trump “a monster”! So, Harry must be scared. He is afraid of this monster, like many of Washington’s political Establishment. Harry is a Democrat, which really doesn’t matter that much when we are talking about political monsters. 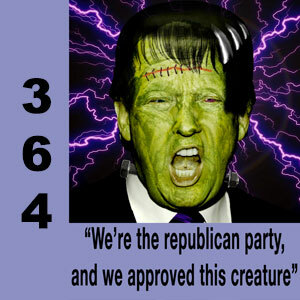 Both Democrats and Republicans are afraid of the monster. Why are they afraid of this beast? They are afraid of Trump disrupting the political Establishment’s BUSINESS AS USUAL platform of governing. They are afraid of what will be exposed in Executive and Legislative operations, if the country is run like a business from a competent CEO. Remember the movie “Dave”, will meet “Donald”. What Harry, Marco and to an extent Ted fear is, they will lose their comfort zone, they are already unraveling. Rubio is desperate, not only for himself but as the Establishment’s sudden choice, the pressure is on him. MARCO, YOU CAN’T LET THIS MONSTER WIN WE’LL BE FINISHED AND POLITICS AS WE KNOW IT WILL BE GONE FOREVER! No wonder Rubio sweats like a man having a heart attack! The Republican Establishment, and soon the Democrats, if they don’t find a way to steal the nomination (literally); are experiencing something they have never taken on……..someone is speaking up for the anti-Establishment; angry Americans. The Republican Establishment leaders are looking for a way to shut up Donald Trump, to shut up OUR VOICE. Trump is winning the greatest number of votes for the nomination, but they’ll steal the nomination anyway they can to prevent him from being the elected choice. Your voice, your vote will mean nothing. Marco Rubio is beating the “Donald Trump is a Con Artist” drum to death. Really Marco, you tricked your state into electing you to the U.S. Senate and you are a frequent “NO SHOW”. Who is the Con? The Established Democratic and Republican parties have been conning Americans for 2 centuries and We the People have had enough. Donald Trump isn’t the problem, he is our desperate hope. He is our “Lets try something else, lets run the country like a business for once.” The establishment created their own monster……….and they can not control it. They can not control the American people any longer. Look where we have gone! James Madison to Nancy Pelosi! God save us! Our Founding Father’s forethought shames the thoughtlessness of present day moronic elected and re-elected officials today. You have to wonder when the dumbing down process really started with the likes of Pelosi, Harry Reid, Obama, Clinton (both), Bush (both), Carter…….it goes on and on, I’m just getting started. We choose from what we have to choose from. We must get smarter, improve the quality of candidates, or we will continue to get what we have always gotten. Crap! Normal people must start getting involved. NOW!